So, I’m finally caught up to myself on the blog! Yippee! And I’m heading into my second trimester which will bring more of a reveal to who I am. While we’ve enjoyed sharing our special news with family and friends in person, it’s just not possible for everyone in our lives given the great geographic differences. Once we’ve shared with everyone, I’ll share more about me with you. Thanks for your patience! This was a really tough week for exhaustion and pain. Especially the pain. Eleven years ago, I had a breast reduction, going from an almost E cup size to a B. I am so happy with that decision because it brought me much relief in back pain, trips to the chiropractor and the ability to shed my ugly, huge, expensive bras for the much cuter and more economical alternatives. However, in these 11 weeks, my chest has grown rapidly in preparation. My bras are barely fitting and there are days where the tenderness is overwhelming. To top it off, this week, my back felt the brunt of the growth. And it was very uncomfortable to sleep, hence the exhaustion. I got a chiropractor appointment on Friday morning. Not only did that provide me instant relief, she also gave me a few tips for sleeping and a scapula brace to help with my posture. After my appointment, I napped most of the day! My stomach is also beginning to pooch, but instead of the cute bump, I just look like a fat kid. Looking forward to the cute bump! This is not a fun phase since I have worked so hard to not have a tummy the last 3+ years. As a result of the back pain, I laid off CrossFit so I wouldn’t hurt myself further. I did make it to one WOD, but the rest of the week, I just took our dog on really long walks. Metcon: Three Rounds for time – weighted run (45/25), 30 weighted sit ups, 20 ground to overhead, 15 box jumps (24/20) – 16:55/168 rpm. I ditched the weights for the first two movements because of my back + pregnancy. I really had to slow myself down with everything to better keep my heart rate in check. Wasn’t easy since I’m so stinking competitive! Oct. 13 2.15 mile run with the pooch. Took about 25 minutes (had some potty stops with pooch) and heart rate reached 164 rpm. Felt great to have running weather again! Food: This week was much easier to get back into cooking. The hubs was praising Jesus and all that’s holy. While I managed some cooking, I also had some crazy cravings – Cheez Its, Fruity Peebles (yes, seriously! ), Barbara’s peanut butter Puffins and popsicles. Breakfast has been really difficult and making sure I’m getting enough veggies is equally challenging. Today I made ham and egg cups to help the both problems. 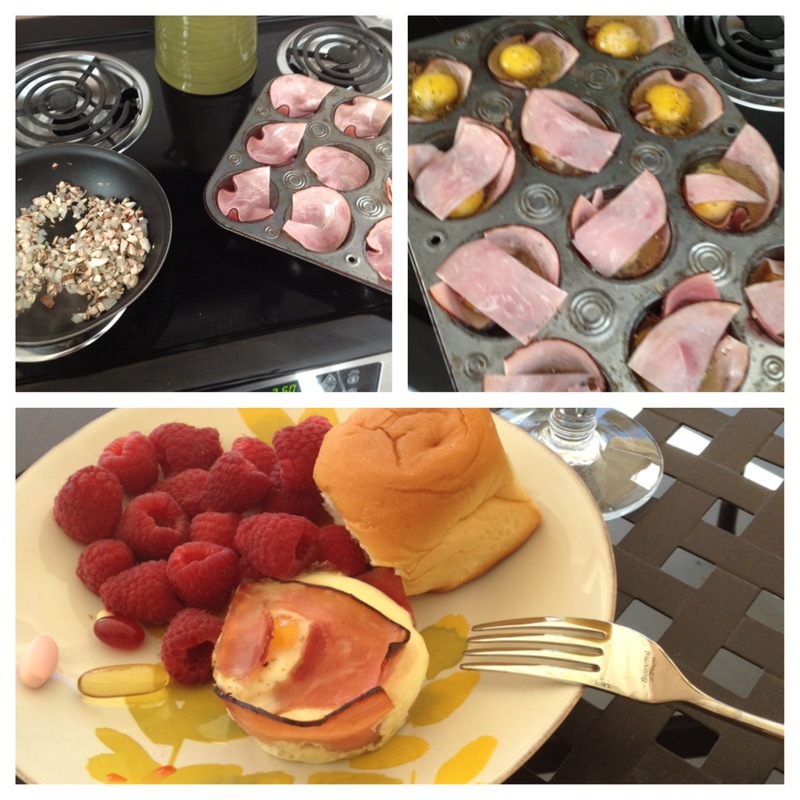 Super simple and paleo – preheat oven to 350 degrees; saute 1/2 cup of onion and 1/2 cup of mushrooms; spray muffin tin with olive oil spray and place ham slices in cups; spoon in mushroom and onion mix; crack individual eggs into ham cups; bake for 15 minutes or until ham edges are crisp. Enjoy! Posted on October 13, 2013 by crossfitpregs. This entry was posted in CrossFit and tagged back pain, breast reduction, Chiropractic, CrossFit, CrossFit Mom, exhaustion, Fit Pregnancy, Health, Heart rate, Pain, paleo, pregnancy, WOD. Bookmark the permalink.